The evening stage at that time… Begolli prepared the Jom Talent se jo Mahi [No Joke, I am a Talent], which constantly dealt with, with the problems of the society, and talked about our daily life in a sort of cynical way. [The show] had an extraordinarily big audience. In the Puppet Theatre, we tried to organize everything that was lacking in school life, concerts, masked balls. We somehow tried to fill the emptiness that existed in schools. So, the theatre at that time wasn’t simply a theatre. It was a garden, entertainment, education and everything else. And I hope I was successful in that job. However, we didn’t let people be swallowed by the sadness that existed everywhere, in the streets, at home. Here there was a kind of oasis where they could feel freer, more… see a different world, maybe live a little of that fairytale, that illusion. It was a little bit of freshness for those people. Melihate (Meli) Qena was born on December 15, 1949 in Mitrovica. She studied acting at the Academy of Theatre, Film and Television in Belgrade, Serbia. She started working for the Radio Television of Pristina immediately after it was founded and worked there until the ‘90s when it was closed by the Milosevic regime. Alongside her job the television, in 1986, she started working at the Dodona Puppet Theatre in Pristina, where she debuted as a director with the play Pylli është i të gjithëve [The Mountain belongs to Everyone]. She worked as a theatre director at the Dodona Puppet Theatre until her retirement. In 2015, she was awarded the prize for Lifetime Achievements by the Ministry of Culture, Youth and Sports. Qena played in many theatre plays and films, among which are the movie Martesa [The Marriage], Kësulat [The Headgears] and A dream. Currently, she works as a resident actress at the Dodona Theatre. Melihate (Meli) Qena: I come from a family of workers. My father was a baker, breadmaker. He comes from the village of Has. Hasjonët are known. Hasjonët are known for working all around Yugoslavia, wherever they work, they mainly work as bakers. So, my father baked very good simite, the best bread, the best croissants. And we always had hot bread at home. We often sustained ourselves with bread and pickles. We are nine children. We were nine children. I don’t have my brothers anymore. My older brother was engaged in the arts. He was an actor, director. He finished the School of Film in Belgrade. And of course, as often happened in big families, the other children were influenced by the choice of their older brother. I don’t know, maybe it is a kind of instinct or something, I don’t know how to call it…Maybe it was because we didn’t know what to choose, we saw the older brother and went after him. So, mainly our whole family was engaged in the arts and this is not a privilege. Maybe this is more of a misfortune in our society, having a whole family engaged in arts because art was never valued in any period the way it should be. So the whole family became a victim of a job that doesn’t bring much income. My brother…I told you, Muharrem who was a director and actor. Then Xhevat was an actor. My third brother, Nehat, he was a culture editor, he worked for Rilindja, and my youngest brother Agim Qena, for thirty years he drew the comic Tafë Kusuri. And people, I am talking according to what other people told me, always read Tafë Kusuri and measured the pulse of the society that way. Where is the society going, what is happening, because he had the ability to say in a few words, everything that was happening. I believe that caricature is a very difficult profession, and he went first, he passed away first, he was very young, before turning fifty. We are five sisters. My sisters are teachers, English language teachers and I am, I dealt with…I finished Acting in Belgrade. Then after returning to the theatre, I had a disagreement with those in the theatre because a whole generation of my age, were actors…So they told me, “We don’t need you.” And I told them, “But you gave me the scholarship for four years.” “It’s alright, the scholarship doesn’t matter…” So, long story short, I never worked for the theatre. I worked for the television since the time it was established here. In fact, there was television even before, before ’74 we had a show in Albanian in Belgrade. But in ’74 it moved to Pristina with its whole program, and the Television of Pristina was established. And I wonder how after the war people accepted starting everything from the beginning. Not to take those who had been employed before…I mean, they recruited a whole new staff…which in my opinion is wrong. And I believe you can never find such an example as ours in any nation in the world, you can’t find people who don’t save what has been before and who think that everything begins with us. I am just telling you to give you an idea, in Belgrade I had a photograph in front of the staircase, I had a photograph of an actress, an amateur actress, she wasn’t even an actress and I was forced to learn at which coffee shops she performed, because in fact back then they didn’t have a theatre. But they say they have the theatre from 1800, from their very first appearances. So, I believe that we are the only nation that erases the past. I believe that there might be a women’s complex in our society, women want to hide their age, looks like we want to hide our age too and we always want to be young (smiles) in profession and work and this is not something to brag about. It is a big shortcoming, in my opinion. In the television I mainly worked with children’s and educational shows. Aurela Kadriu: Before going there, Meli, maybe some more details about the setting in which you grew up, as a child? Aurela Kadriu: What do you remember, what memories do you have? Melihate (Meli) Qena: I…The childhood of my generation is so different from the childhood of children nowadays, because for us, imagination was everything. We played with some slopes, with some random stuff…We didn’t have many elements which we played with. But it was more, all the games were played in our heads, in our imaginations and now…it’s like nothing is left to children’s imaginations. I don’t know what more can they imagine, what? They have perfect toys and sometimes I believe that it a toy becomes monotone. A child sees a toy, you buy it for them, it is an expensive toy, after five minutes they get bored of it because in order for something to be fruitful, one has to feel it, one has to be interested about it. To develop the imagination, to develop…that is when a work is fruitful. If everything is given to you ready, then this is like fast hamburgers that are all prepared, you only have to swallow them, and they are different from the food you cook yourself, slowly, according to your own wish and desire, and it tastes differently. So, our friendship might have not been rich with toys, but it had another kind of quality. It had imagination, more socialization, we had a greater circle of friends, we were always together with our friends. Now I guess one is lonely from childhood, no matter if they send children to kindergartens and want to socialize them before they are used to their mothers and fathers. I don’t know whether a child knows their mother and father when they are sent to kindergarten, sometimes with a need and sometimes even without it. I know many parents where mothers are at home and however, they send children to kindergarten. Why? In order for them to socialize? I don’t understand how a child can socialize with some stranger before they get to know you. That is why I think that this follows a child later in their life, loneliness follows them, a kind of fear to connect with people because no matter how much we think our children socialize, we don’t know that there are different temperaments, different kinds. Some socialize, some don’t, and those who are more sensitive are usually the ones who suffer more in these big, so-called, socialization circles. In fact, there are a lot of people, and most of them are alone. Of course, that wasn’t the case for my childhood, because we were, we selected two-three, four-five people with whom we could share the pain, joy, sadness and everything. As for myself, I was alone most of the time. I wanted to be alone in a corner because I am telling you, I grew up in a house where there were a lot of children, but I always chose a corner where I played with my toys, some dolls I made myself. And I know that I played with dolls for a long time, maybe this was something that followed me later, or a kind of feeling that I would deal with Muppets later, excuse me (coughs). So we were more connected, the whole life, even during school, childhood, we were more united, more…There were various clubs and associations in our schools which dealt with, each one of them according to their talent, children dealt with…and we were constantly under the supervision of our teachers, so we had a kind of care given to us. The best and the worst that could happen, happened inside the school, there weren’t this many coffee shops back then and I don’t think it was much of a shortcoming. The whole life was more organized, there were literary evenings every Saturday, we would go to classrooms or sports halls and listen to the poets. I don’t know whether people do that anymore, do these children listen to poetry interpretations? The grandchildren I have at home, they don’t know any poems. I don’t know whether they learn that at school, I guess they are not asked to learn that at school. Because maybe there is a new program and this new program doesn’t consider it important for the children to learn poetry. I think if the world only deals with natural sciences and deals so little with poetry arts, that world seems harsh to me. And it is almost impossible for the human to live in this harshness, because arts is what inspires the human, they make them more generous. So all the goods, a subtle and sensitive life come from arts because the human is not only body, it is also spirit, and the inner part of the human needs to be developed. A human has some very thin fibers that can only be developed through arts. Aurela Kadriu: Ms. Meli, do you remember how was it for you growing up in a family of artists? Can you tell us a little about that part? Melihate (Meli) Qena: I barely saw my brothers during my life because they lived in Pristina and we lived in Mitrovica. So, when they would come occasionally, it was a feast because my oldest brother sang very well and he would take the guitar and we would gather around him and sing. My father loved the song so much too, and almost every night he gathered us children…we were a small choir. I was the one who almost always ruined that choir because I didn’t sing very well, but I wouldn’t sing so loudly so that I wouldn’t be noticed and I was somehow overshadowed. But ours was always a joyful family. We didn’t have much, but we shared whatever we had with each other. It never happened, for example when we sat around the sofra, it never happened that we didn’t ask, “Does this belong to me?” Because there were many of us and each one of us had their part. So, we didn’t have much but there was a kind of solidarity, and that solidarity followed me in life afterwards. I don’t know maybe it would be better if somebody else who knows me spoke about this part because I don’t even like eating alone, or drinking alone, I don’t like it. I want to share this part of my life, I always wanted to share the good parts of my life with the others, except the part where I work, that is the only time I like to be alone, and that is the time when really, I am bored of everyone. So, the life in a family with many children was interesting. But we didn’t have much, we were very poor at that time…Even though, the whole society was such but maybe we were distinct in that regard because we were many children at home and I often had to wait for my sister to return from school in order to take her shoes, or the coat. Once it happened to me during a class, because we didn’t have a hall for physical education classes and we would do it outside, in the garden. It was spring time, we went to the garden and played some ball games and I don’t know what, and I forgot my coat, there were trees in the school garden. I forgot my coat hanging on a tree, and when we went to the other class, I remembered the coat and without even asking my teacher, I ran and went out to find the coat. When I came back, my teacher asked me, “What happened? What was that?” I said, “I had forgotten my coat hanging on a tree and I went to take it.” He said, “Eii, the historical coat, the one that you are wearing generation after generation?” I said, “Yes, we take good care of it precisely for the fact that it is a historical coat.” Of course I was so touched by those words but I didn’t want to create drama in front of the children, that is why I said, “I take good care of it precisely because it is historical.” So even the teacher, since we had the same teachers generation after generation, remembered that four-five generations grew up wearing that coat. Aurela Kadriu: Where did you go to school, where did you go to elementary school? Melihate (Meli) Qena: I finished elementary as well as high school in Mitrovica. Aurela Kadriu: At which schools? Melihate (Meli) Qena: At school…Back then it was called Svetozar Marković, the current Muharrem Bekteshi elementary school. Then there was the gymnasium, I went to gymnasium in Mitrovica. And then I enrolled in Russian language because at that time you couldn’t exactly choose what you wanted to study, but what they provided scholarships for. They were only providing scholarships for Biology and Russian and…I liked Biology a lot, I could also study Biology but just when I started studying Russian here in Pristina a class was opened, the call was open in ’67, in 1967, a call was open for a group of Albanians who wanted to study Acting. I applied and got accepted, then I finished, I know the language well, I speak and translate from Russian time after time. Aurela Kadriu: Can you tell us a little about the period of high school? How was it for you, how do you remember? Melihate (Meli) Qena: Yes, the school and all the entertainment of that time. We gathered in physical education halls on Saturdays, organized balls, and dancings which I barely attended. Once I went with my sister and I only saw a big hall because the seats were all around and in the middle, there was space for dancing. So the idea was that somebody would come to choose you to dance with, I was waiting and waiting for someone to choose me and nobody did, so it was almost the time to go and a boy came to me, he started to ask all the girls to dance with him, he asked the first, the second, the fourth, the third…they didn’t want to dance with him and in the end when he came to me, seems like he was bored and didn’t even ask me, he sat down. So I realized that I am not that lucky at balls and I never went again. Even though, at that time, that was the only entertainment event girls would attend. There was Rock and Roll, I knew all the games, but I exercised on my own rather than at balls. So the only entertainment there was…And, I am saying, there was the drama group where we prepared drama plays, we prepared the school program. I was always part of it and I was one of the best interpreters, I believe that I am a better interpreter than an actress. Because I like poetry a lot and I do it with love, with will. And everything that is done with love, will certainly be successful. Aurela Kadriu: Can you tell me how did it happen that you went to Belgrade? What were the circumstances? 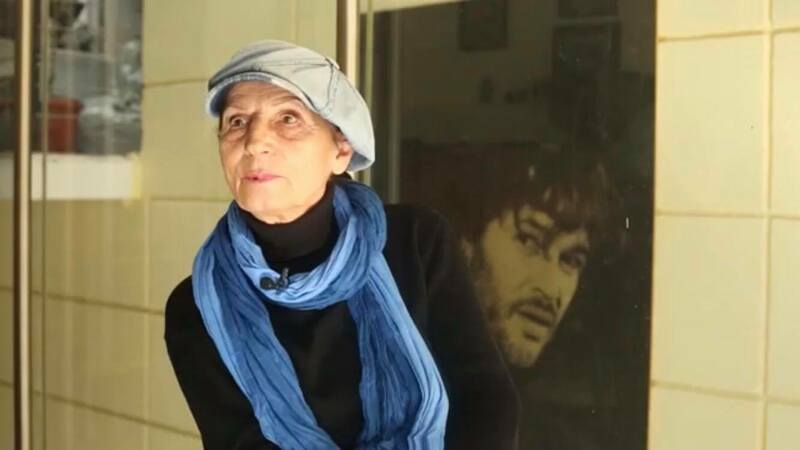 Melihate (Meli) Qena: There was an open call here in Pristina, because they wanted to educate a generation of actors because here we only had the High Pedagogical School, there was no faculty for acting. I guess they thought that it was too expensive to bring the professors from Belgrade, so they sent a group of youth among which I was too. There were two other girls, one from Peja, she was very beautiful and talented, she was shortlisted. Because first we had the audition, if you are accepted in the first circle, then you work with professors for fifteen days and then there comes the second admission exam. If you get accepted then you continue, otherwise you fail and cannot continue. She returned, I remained with my male classmates, of course I missed a…Even though, we took almost all the classes in common classrooms with the Serbian group, but we did the acting separately. We learned the texts in Albanian language, our professors had the translations. My brother Muharrem was a professor and at the same time a student, so we were mainly working with him. And I hadn’t talked to him initially so when he saw me in Belgrade he was like, “What do you want here?” I said, “Like that, I am studying.” “But why? This is not for you, you are sensitive, it is a difficult job…” Knowing me and knowing how extraordinarily difficult it is as a job, how much work and commitment it requires, maybe he wanted to spare me from it. But this is not something someone can spare someone of. One goes as one does, maybe sometimes it is a matter of fortune when one thinks about choosing something completely different and then the complete opposite turns out. We think that one can affect their path. I believe that some things are connected to fortune, it is not that you can direct everything on your own. Life is not a symphony which you direct and it goes according to your orders, sometimes something you haven’t even thought about happens…but we must have our life path set, our fortune set. Maybe when we come to this life, we come with a certain duty and our fluids, atoms make us go that way, I don’t know. When I returned in the evening, we had a club in Belgrade, Përpjekja [The Struggle] and I spent most of my time at that club, if it wasn’t for the Përpjekja where Albanians would gather and where we had all the instruments, we would sing and there was even television, then I don’t think I would be able to manage to stay, I would return. So the first year was mainly the year of getting used to living there…maybe the year of regret for why I had gone there and why I was alone, without any other girl. And so I thought more about how to return than how to stay. In the first academic year I was so bad that I almost failed, because I made almost no rehearsals. And then (smiles) when I got used to living there, my professors were like, “Now we see what you are…We saw it, we knew it, but you didn’t open up…” Because the art is a weird job, very complicated and subtle, it takes a lot for someone to open up and the pedagogists have to be very patient until a young person, an actor opens up and reveals everything they keep within themselves. This cannot be done with force, it has to happen gradually. It takes patience and all the conditions need to be provided for the new actor in order for them to open up like a flower, it shouldn’t be done otherwise or you might lose a talent. I have often heard pedagogists saying, “If the talent is there, then one opens up and shows themselves, if it isn’t there, they will go…” But it is not like that, a pedagogist needs to be patient. I believe that applies for other subjects and departments too, but especially for acting. Melihate (Meli) Qena: Yes, yes. I mean, the first meeting, the first experience with him was very bitter, harsh because he didn’t want to help me, he wanted to convince me to quit the art and go back to Mitrovica. And I almost wanted to return, but maybe there was something greater, stronger that attracted me and I remained there. Since I stayed, I could also do something else in life, for example if I studied biology because I am so interested in flowers and plants, it is a world within itself…maybe I would be a lot happier, I don’t know. But arts is a kind of discovery, a kind of growth, a kind of development…that is why it has some things in common with the nature, plants, with everything. Aurela Kadriu: Can you speak a little about that group, Përpjekja? Can you tell us about those gatherings? Melihate (Meli) Qena: Përpjekja was an association of Albanian students where we would gather every evening. We had the group of musical instruments players, the group of choir and the group of interpreters. Whenever there was something concerning interpreting, they would invite me, Ehat Musa, the famous guitarist was part of that group too. Then Ukshin Hoti who was doing his Master’s in Belgrade at that time, was also part of the group for a long time, I know him closely. Many Albanian intellectuals were part of that group, there was Professor Cana who was doing his post-graduate studies. There were big age differences, from people doing their Bachelor’s to mature people who were doing their Master’s or Ph.D. studies there. There was a diversity of ages, experiences and various people who were interesting, coming from different fields. And I am telling you that every Albanian found themselves there…this was like a big shelter for all the beginners, until they got used to living in Belgrade…Because Belgrade at that time was a really international city because people from all over the world came there to study. Then there was BITEF, the theatre festival that is still being held was constantly held, even during the war. And there we met, we got the chance to meet various actors, directors and get to know them closely. At that time, Odisea with Bekim Fehmiu was being shot…Faruk Begolli was also part of the academy, at that time he had already done some movies but didn’t have the right to get the diploma of the academy without going to classes. You could be an actor without the diploma, but they wouldn’t give you the diploma if you didn’t regularly follow the classes and if you didn’t get the signatures from professors. Hasjonët refers to people coming from the Has region, an ethnographic area located in southwestern Kosovo. Rilindja, the first newspaper in Albanian language in Yugoslavia, initially printed in 1945 as a weekly newspaper. Low round table for people to gather at communal dinners, sitting on the floor. A European type of secondary school with emphasis on academic learning, different from vocational schools because it prepares students for university. Bekim Fehmiu (1936-2010) was a theatre and film actor born in Kosovo and the first Eastern European actor to work in Hollywood during the Cold war. .
 Faruk Begolli (1944-2007) was a prominent Kosovo Albanian actor and director in former Yugoslavia. He attended high school in Pristina and graduated from the Academy of Film in Belgrade. Aurela Kadriu: Did you get the chance to…since you were students from Kosovo, did you get the chance to communicate closely with him? Melihate (Meli) Qena: Yes, yes. He knew that we were a group of Albanians and said, “I feel so good that you have decided to come here to study because there is really a lot to learn.” And then he constantly followed my work. Even when I graduated, he came and waited for me until I undressed the costume and introduced me to all the professors and directors, he told them that I was from Kosovo, an Albanian had graduated. And he was very close, very very close, somehow in a way, he protected us. I had a kind of shelter, I saw protection in him. In the first contact, he seemed untouchable, somehow very high, with a lot of authority, so one is betrayed by his looks because somehow it would make you feel small…But this was the case only until the first sentence, conversation with him started, then you feel totally different. Because he had the ability to make you feel free…to not feel the difference. Begolli was absolutely different, he was communicative, he was close to everyone. And maybe the more sensitive a person is, they build a kind of armor, they seem untouchable, they are not open to everyone, but once you get to know them, it is completely different. Aurela Kadriu: Did you ever come to Kosovo, to Mitrovica during the time you were studying in Belgrade? I think my time in Belgrade was waiting for the rain to stop so I could go out…which is wrong, of course, but those mistakes were unavoidable for me because I was alone, I was…I feel bad to say that I was the first, second or the third, but I was really the first and then there were no other groups going to study in Belgrade, there was only another group of director. Because then the Faculty of Dramatic Arts was opened here and I worked there for three months until I realized that I am not a very good pedagogists, and I quit. Aurela Kadriu: Can you tell us how was for you as a girl at that time, constantly travelling alone from Belgrade to Mitrovica? Melihate (Meli) Qena: I can tell you that Mitrovica was a very progressive city at that town because mainly foreigners were working at Trepça. Mitrovica had standards, it had its first Rock and Roll bands and there was classical music being played every Saturday and Sunday. People dressed well would come to the back of the then famous hotel Jadran, where you could listen to Beethoven, Chopin and Vivaldi’s music….So, we weren’t too far from the world, there were golf courses in Mitrovica, swimming pools…Life was very different from other cities, regardless of the fact that Mitrovica is destroyed now and doesn’t look like itself. Back then it there was a class of people who of course, wanted their standards and created them for themselves, but through them, we got to enjoy those standards too. So, there wasn’t a big barrier, except the fact that when I went to a big city, I was disturbed by the noise, the crowd…It took a month until I got used, it would echo in my head, it looked like something…just like Pristina has become nowadays, a real crowd not looking like anything. And of course I had problems until I got used to that setting. Aurela Kadriu: Can you tell us about your graduation, how do you remember it? Melihate (Meli) Qena: My graduation play was a Sartre’s text Lavirja e Denjë për Respekt [The Respectful Prostitute] or the Respectful Prostitute, which is another translation now, but I think that the best translation is the Lavirja e Denjë për Respekt [The Prostitute Worthy of Respect], because this prostitute was such in the sense of life circumstances and not….and there was a role of a female which I played, and four roles of male which were played by my classmates, we gave the graduation show in Belgrade. We graduated, then we played the same show in Pristina, in the Joakim Vujić meetings. Back then the theatres meetings would take place and we played. Of course, when I came to Pristina, people were more curious to see who is this girl who had graduated there, but the curiosity didn’t last for a long time, at some point they weren’t curious at all. I told you that they weren’t even interested to accept me to work for the theater. All the enthusiasm and ideals, all that I dreamt of achieving after the education were destroyed, and I remained without perspective, unemployed. On the other hand, I had finished two faculties at that time already, Russian and Acting. And I remained home, unemployed for almost half a year. Then after the first semester, a colleague of mine whom I had studied Russian together with, left Mitrovica and came to Pristina to lecture, he told me, “If you want to work, to lecture Russian?” I said, “I don’t know if they will accept me. He said, “Of course they will accept you, they don’t have a Russian language professor.” I went, applied, they accepted me and for half a year I worked as a Russian language teacher, there were mainly Serbian students, because they wanted to learn Russian and there were only a few Albanians. After that year, the professional theater was opened in Prizren. I went there for one year, you know how things work here, people are enthusiast, they want to do something and then it lasts only for one year, after one year they got cold. The theater’s life was short, just like my illusions. Aurela Kadriu: Tell us a little about that theater in Prizren. Melihate (Meli) Qena: It was during summer vacations when one day, a car parked in front of my house in Mitrovica. My house was in the city center. An old house with garrets, the garrets are very romantic. They have torn that house down now. And somebody came out of the car and looked for me, “Come on,” I said, “Who is it?” The director of the theater of Prizren, of the Culture Department. Anyway, I went to talk to him, he said, “I’m thinking about opening the professional theater and taking a group of actors, would you accept being part of it?” “Yes,” I said, “I would.” And then we went, there were four-five actors, young actors, some of them from Prizren and some from Mitrovica. My brother Muharrem together with his wife Igballe came at that time too, they became part of that theater as well. We thought that the work in that theater would last, we had big ambitions in the beginning, great commitment. But it didn’t last long. After one year, they said, “You know why, the theater seems to cost too much, we cannot keep it.” I don’t know why they opened it and why they closed it. I didn’t understand why they opened it in the first place, I guess they wanted to cover some of their businesses which I never understood. And it was more a matter of bragging about the fact that they were opening the theater, and it is very easy to open a theater, maintaining it is the difficult part. It is very difficult to maintain a theater, to work continuously, it is something that requires commitment and patience, but it is also very hardly accepted by the circle…Everything that is new faces some obstacles in the beginning…You have to stand strong, first they don’t take you seriously, they make fun at you. Then you have to convince people that it is not a matter of fun, it is not a matter of bragging about it but it is something serious, something you have to work for. Then they start looking at you with anger, then they start not helping you, and then they start interrupting you. If you are capable to stand all this, in the end it’s either they that give up, or you. If you are strong, you stand. Aurela Kadriu: What were the plays that you had at the professional theater of Prizren? Melihate (Meli) Qena: We prepared two-three plays during the time I was part of that theater. I played in two of them. There was the Colonel Chabert, written by Balzac and directed by Muharrem Qena. And there was another one, since the Serbian drama was played parallel to the Albanian one, I played the role of a mother in the Serbian drama. It was the Strange Child of Joza Horvat, a writer from Zagreb, directed by a Serbian director, Milutin Jasnić, who was a very good director. And that was it for one year, then the theater was closed and the group was unfortunately spread. Aurela Kadriu: Can you tell us a little about the audience you had, I mean, looks like a cultural life was already established at least for one year? Melihate (Meli) Qena: Yes, there was a high interest and there was a kind of euphoria not only for us, the actors, but also for the people, they were happy that there was a new group, something was happening in Prizren. But, the worst is that for us it is like when you compress a balloon and then set it free, the air gets out of it and it falls on the floor, only a pile remains of it, very painful. That euphoria exploded somewhere as well and nothing…They continued with amateur groups until the other professional theater was established in Prizren. I hope such things don’t continue to happen…anyway, art is not valued here, especially in some certain periods. There are many mistakes that shouldn’t have happened. Let’s say I go and watch ballet with eagerness and see the young people full of willingness and eagerness, commitment to their work, how willingly they do their job, they work for twelve hours a day and I don’t know if they have enough to buy a pie and a yoghurt, and the ballet doesn’t go together with the pie, because one has to be healthy and have conditions in order to play. And so those young people who should have the support of society, and not only the support but also the wellbeing and everything else, those are the ones who have nothing. They simply take some players who only play for their entertainment. Those in power don’t even come to see them. It doesn’t matter that they don’t come, because they don’t miss the ballet, but they should take better care of a young generation. Those people can go like that until they turn 20-25 years, but if you think about creating a family, having a house and a future of your own, then you have no other way but quit that job and deal with something else because otherwise it is impossible to survive. Aurela Kadriu: In which year did this theater in Prizren close, in which year? Melihate (Meli) Qena: ’73. It was opened in ’72 and closed in ’73. In ’74 I came to work for the television, and I constantly worked for the television until 1986 when the Muppet Theatre was opened, and then I continued working there at the same time until the television closed. Melihate (Meli) Qena: There was an open call, they were looking for a director for the television and I applied, they accepted me since there were no educated directors at that time. And in the beginning, since we didn’t learn anything about television in Belgrade, I talked to some of my professors in Belgrade and went there for around three months, followed the work in the television, how TV shows are made, the shooting all the specifics of the television which I hadn’t learned while at the academy, and I got a kind of solid knowledge. Then, I worked in the television, and I had a lot of practical work to do because no matter that we weren’t a big staff, back then we worked a lot in the Television of Pristina. And in the beginning, I started as an assistant, then as a director, then as a first category director and in the end I left as an independent director which means I had the right to choose topics and whatever I wanted to work on. But, after getting that title, to say it like that, the television closed and then I didn’t have time to exercise, unfortunately, when after the war they didn’t accept anyone from my generation. And the title independent director only remained on paper, because I was really independent of everything and the job in the television remained nothing but a dream. Aurela Kadriu: Can you tell us about how you started working…how did the Muppet Theater open? Melihate (Meli) Qena: The Muppet Theater…BVI of culture, the back then secretariat of culture, there was a lady working there, her name was Rabije Bajrami, her son is an editor-in-chief at Koha Ditore, Agron Bajrami. And she had a vision, she wanted to open a Muppet Theater considering the fact that Kosovo always needed a Muppet Theater. There were many children and there was never a theater. So then she decided to gather some people, among them the famous director Ismail Ymeri, with whom she discussed and then a group of people was established comprising of Fadil Hysaj, Ismail Ymeri, Musa Ramadani, Anton Çetta, some professors. They opened an audition and selected 17 boys and girls at that time, then a famous professor from Zagreb, Borislav Mrksić who was a dramaturgist and a director, worked with them. He graduated in directing in Prague. He was an erudite, a person with a lot of knowledge. And this group of young girls and boys worked with him. The first play was Pylli është i të gjithëve [The Forest Belongs to Everyone], written by Shaip Grabovci, and it was a combined play of actors and muppets and it turned out really good and that they were a group of really talented people. Those people continued working but they were paid only per play and so they saw that there was no secure perspective from that theater, and from 17 people, the number gradually decreased…now we are only five actors, four men and one woman, this doesn’t happen anywhere in the civilized world, this ensemble of actors was supposed to have 350 people up to now, not only five. But we cannot escape our everyday life, the mindset of our people, the mindset of starting everything with euphoria. Then it remains dependent on the willing and desire of some fanatics, on the desire of some people who take care of it with great fanaticism, commitment and almost self-sacrifice…and for which I also worked with my own wish and I love it but I never asked to be thanked, I never asked for fame. I cannot say that I wasn’t often hurt because of carelessness and the lack of value for this work from people who are responsible, who should’ve brought progress to this theater, who should’ve worked for this theater to move forward, each city should’ve at least have one Muppet Theater. Not like this, we only have this theater and nobody cares about it. Aurela Kadriu: About the ‘90s, when you were expelled from work, how did it happen? Melihate (Meli) Qena: Yes, in the ‘90s there was a condition, to either accept working under the directions of the people who came here and occupied the television, or quit. And of course we had no other solution, we either had to do whatever they wanted us to, but those people really occupied us, they simply came one day and took the television and then we had to obey their orders. Nobody wanted to do that, they said, “If you want to work you will have to sign the capitulation of Kosovo, if not, you can leave.” We all left and remained on the street, unemployed. At the theater we had, of course there were no salaries for the actors, I was the only one receiving the salary and Valdet Rama, as the manager of the theater. The others worked from one play to another, until we earned something from the tickets, so that job was more like a volunteer work, because nobody could deal with it seriously, if somebody thought about it. Then each one of them chose their own paths, they went elsewhere and slowly we saw the theater being destroyed. A power of Sisyphus was needed for the theater to stand and bear all the neglect from society. However, we worked, we always had our audience, there weren’t many people in the beginning but it was established with time. Now we give two shows, on Saturdays and we also have organized shows for kindergartens, schools and for…and the theater is full of children which is a good feedback for all the work that we have done for years. Aurela Kadriu: Until when did Dodona work? We are speaking about the period before the war, until when did it work? Melihate (Meli) Qena: Dodona worked constantly. It worked even during the war. It was the only oasis, the only theater that worked. Because it worked…it worked as a private theater of Begolli. Begolli had a registered theater and they couldn’t ban it, so we worked within that. In fact, they didn’t ban the children’s theater, so we could continue our activity and it was a kind of oasis where children could come and…we weren’t that free, because they were interrupted time after time, but we mainly never stopped working no matter…We often thought that we couldn’t even give the play because they often didn’t let children come. The police often stopped children on the way, but they came through other paths. So…however, we worked constantly. And this year, the theater celebrates its thirtieth anniversary. Melihate (Meli) Qena: I was engaged in movies and other plays. I played in plays of the National Theater as well. In fact, I played more now when I became old than when I was young, because it happened that way that they needed actresses of my age and they invited me. I recently played in two-three movies. One of them is of Lendita Zeqiraj, the very last one. Then I played in another movie of her sister, Blerta Zeqiraj. Then there is another movie of Arzana Kraja. It looks like I am accurate for the taste of directors (smiles). I played in some plays of Bekim Lumi. So…but I like working at the Muppet Theater, I find myself better there, I feel happier, more free when I work with children and when I work in the theater. Aurela Kadriu: Can you tell us about the war time, how was it to continue working at that time? Melihate (Meli) Qena: During the war time, the theater was like a house where we constantly gathered, no matter whether we had rehearsals or not….Most of the students slept in the theater when they didn’t have a place to sleep. The theater was not simply a theater where plays are given, but also a place where the students would gather, where they held their exams, where they played…The plays were always given as well. So it was maybe a light in the black tunnel. It was the only sun where we could breathe freely, maybe. Often under the control of the policemen who came and controlled us but maybe since Begolli was so famous, there was not so much pressure. They allowed us to work. So, there was even Petrovci, Enver Petrovci who returned from Belgrade and who was the director of the theater at that time. Maybe under their coverage, we could work a little more freely and not be so controlled. Aurela Kadriu: Can you tell us how did the audience change, was there a change of the audience or not? Melihate (Meli) Qena: The evening stage at that time… Begolli prepared the Jom Talent se jo Mahi [No Joke, I am a Talent], which constantly dealt with, with the problems of society, and talked about our daily life in a sort of cynical way. [The show] had an extraordinarily big audience. In the Puppet Theatre, we tried to organize everything that was lacking in school life, concerts, masked balls. We somehow tried to fill the emptiness that existed in schools. So, the theatre at that time wasn’t simply a theatre. It was a garden, entertainment, education and everything else. And I hope I was successful in that job. Aurela Kadriu: What did you continue doing after the war? Tell us something, be it about your professional life or about your personal life. Melihate (Meli) Qena: I thought that we would be better after the war and that the theater would experience progress and that there would be other actors, but which unfortunately didn’t happen. It happened that they renovated the theater, Ms. Vlora Dumoshi was the director. The theater was renovated, but two actresses whom I always asked for after the war, I had those two actresses, but they went abroad and I remained alone. Considering that the Muppet theater is a very specific theater, and we deliver the same plays for thirty years…We have a play that has been delivered for thirty years, it is constantly in the repertoire. Because the generations of children change and the fairytales are the same, the events are the same and they are interesting for every generation, for all the children. Because we really don’t care much about children…and they only mention children in political campaigns and in…in fact we don’t think about children much. And only the parents is not enough, the society, the people should invest in children rather than only speaking about them. Because if we thought about children, we wouldn’t have classrooms with forty children, with forty students. Our schools would be different, we would have theaters in every city, because the theater is not only for entertainment. The theater is lessons, it is game, it is development, widening of horizons. And those who know about the theater, know how useful it is for children. It is a play, children learn a lot through plays, without being imposed, without being directed…Children grow through plays, obviously. But maybe, if it continues like this, it is a very bad prognosis and I hope people will become aware. Aurela Kadriu: What happened in the meantime in your personal life, what happened in the meantime? Melihate (Meli) Qena: Nothing but bad things have happened in my personal life, I don’t know how can something good happen when the people around you don’t listen to your…when all your requests go into a deaf ear and it returns to you as an echo that makes you confused, “Did I say anything or did I not? Am I just listening to my own voice?” No matter what will happen, I am not thinking about giving up, as much as I can. I have gotten an award for lifetime activity but which for me is not that significant. Because I think they gave it to me so that they would feel good about themselves, I don’t think they thought about myself or my work. For me, I would be more thankful if they listened to my words, if they brought two actresses instead of giving me the award for lifetime activity. Melihate (Meli) Qena: I believe that I said too much. Aurela Kadriu: Thank you very much! Melihate (Meli) Qena: You are welcome! Trepča in Serbian, large industrial and mining complex in Mitrovica, one of the largest in former Yugoslavia. It was acquired by a British company in the 1930s and nationalized by socialist Yugoslavia after the war.